On May 30th 2018, ULI Toronto hosted a Community Presentation for the class of 2018 of its Urban Leadership Program (ULP). 135 people from the community and local councilors attended the culmination of an eight-month long program where 29 mid-career city-building professionals came together to share their vision for two sites on Toronto’s East End: Main-Danforth transit node and the eight-hectare Shoppers World site. Now in its second year, the ULP was developed by a multi-disciplinary expert team led by former City of Toronto Chief Planner Paul Bedford. The program’s focus is on developing the leadership skills of the program participants by engaging in real world planning issues in the selected sites. The program participants were divided into four teams, with two teams assigned to work on each site. In a city experiencing exponential growth, communities are grappling with how to handle strong development pressures. “Many areas in Toronto are undergoing change whether they like it or not,” Bedford said. And for him, perhaps the greatest impact of the ULP is to have these skilled professionals getting together to contribute their ideas into helping communities manage new growth. He thinks that the “fresh eyes” of the program participants can allow them to come up with strong, innovative solutions to help these neighbourhoods deal with the inevitable change, and evolve in a way that is beneficial to the community. It is precisely this prospect for change and new energy in the Main-Danforth and Shoppers World sites that led to them being selected for this year’s program. In terms of site selection, Bedford and his team looked at areas that are undergoing significant change, whether it is generally perceived to be good or bad. “We pick areas where there is development interest and developers are submitting applications,” he shared. 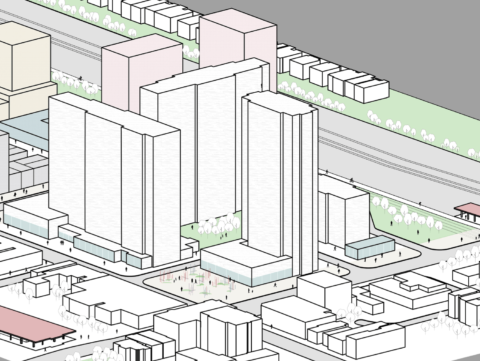 “We try and select areas where there are transit connections, with new or existing transit that is going to open up development.” The Main and Danforth and Shoppers World site sites were chosen because of the wave of new development applications that is expected over the coming years. The program started back in October with a walking tour joined by the local city planner, Daniel Woolfson, and the ward councillors of the respective sites, Mary-Margaret McMahon and Janet Davis. Bedford shared that the tour was one of several memorable moments in this year’s program. “Everyone came together for the first time on the walking tour. Some of the participants have never been to the community and I could see their eyes opened up,” he said. 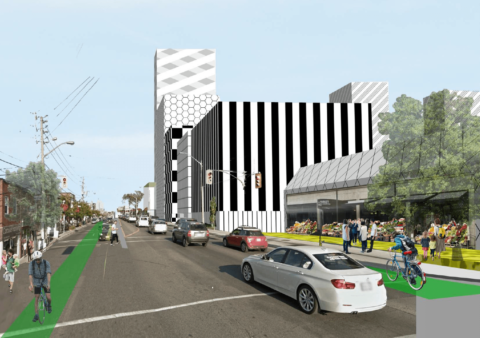 As a designated mobility hub in the Metrolinx Transportation Plan, Main and Danforth is primed for future intensification. Served not only by various TTC transit modes like the Main subway station, 506 Streetcar route, and numerous bus routes, the Main-Danforth node is also home to a GO station just one stop away from Union Station. Currently, there are six development applications for this site, which includes low-, mid-, and high-rise buildings. The challenge for this site is that there is a disconnect between the TTC Main subway station and the Danforth GO station. A 1960s shopping plaza, Shoppers World is also another candidate for future intensification. Close to the Victoria Park subway station, this site is home to several big-box stores and a variety of smaller shops that serve the needs of the local community. Unlike the Main-Danforth node, this site does not have any development applications yet. This is an opportunity for the ULP participants to proactively think about future transformation and craft a framework plan to guide future intensification efforts. Program participants found that working in their teams with other professionals that come from a range of different backgrounds was an invaluable experience. This year’s participants came from different fields that ran the gamut from urban design, law, policy analysis, architecture, and engineering. As an architect, Lui found it beneficial to work with other building professionals outside of her day-to-day work. “It helped me gain a deeper appreciation of the multitude of factors that go into city building.” I hope to draw on these experience in development of future work,” she said. Yeung thinks that the strength of her team is the comprehensive insights from her multi-disciplinary team members. They were always debating and testing their ideas and this process allowed them to evaluate issues through each other’s perspectives. In the end, they were able to walk away with a list of action items that are developed based on consensus and shared ownership. “The ‘a-ha’ moments came when words are put into physical form, and when performance measures can finally be evaluated through imagining experience,” she added. Another one of the cornerstones of the program’s success is that the participants are exposed to a wide variety of speakers that are brought in to share their experiences in the industry during the monthly sessions. “It’s great to have time to pause, and to listen to people, and absorb information. The ULP program affords us time outside of our usual work-life to spend some time every month, listening to someone talking about a very specific topic and actually having a breather to think. For me, the time to think was amazing, and it was really refreshing,” said Maslard. “Normally they will not get that exposure. It is a great opportunity to network and be leaders themselves,” said Bedford. He said that the program could be thought of as a stepping stone to a leadership position. “Enjoy the experience, don’t fret about the project. You’ll get it done.” – Mathieu Maslard, City of Toronto. Brennan Carroll is a partner in the Toronto office of the law firm Borden Ladner Gervais LLP (BLG).